From Bulbbotz. 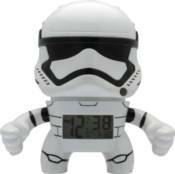 Become an elite soldier of the Galactic Empire with your new Stormtrooper Bulbbotz Clock! With his easy to read LCD screen, powered by the dark side, he will be the perfect partner to go into battle with! Activate his light functions by pushing down on his head and set the alarm with the buttons on his back. Comes with 2 AAA batteries.